The list of influential artists includes Nancy Wilson, Gladys Knight, Kenny Rogers, Billy Joel, Elton John, Ricki Lee Jones and Stevie Wonder. “I was a sponge. I listened constantly and it wasn’t uncommon for me to rehearse three or four hours a day.” Early on her goal was to be a versatile singer. Having far surpassed that initial goal, Toni has developed an all-encompassing voice that contains great power, range, agility and gracefulness. Toni's professional experiences include being a church soloist, recording radio commercials, touring as lead vocalist with a big band, singing in cabaret shows, fronting jazz combos and directing and uniting with others in traditional choral and vocal jazz ensembles. Ms. Gates added songwriting to her repertoire and produced her first CD of nine originals, Outside the Lines, in 2003. “Each song reminds me of some place I’ve been or of someone I’ve known.” The listener will find nice surprises in “Over and Over,” which focuses on the battles a loved one with drug addiction tackles; “Look,” written for her husband, light-heartedly covers new love and how it keeps us slightly off kilter and “Good Things,” speaks to everyone who struggles with depression and reminds us that there is a light at the end of the tunnel. From there Toni started producing and showcasing herself and area talent in her annual “One by One” concert series in 2004. Previously featured artists include Teri Wilder, Monique Danielle and Fredrickson Hill. 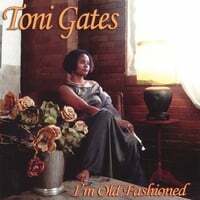 In February 2008 Toni co-produced and released her second CD, I’m Old Fashioned. The project features fresh takes on classic jazz standards like: Billy Strayhorn’s classic, “Lush Life”; "The Boy from Ipanema" ("Garota de Ipanema") with music by Antonio Carlos Jobim and Portuguese lyrics by Vinicius de Moraes with English lyrics written later by Norman Gimbel; and the title track. As an educator, she has worked with theory and vocal music students at Paseo Academy for the Performing Arts, the 18th & Vine History and Performing Arts Summer Academy, Missouri State University, The University of Kansas, the Music Arts Institute and Penn Valley Community College. Toni has had the great fortune to hone her musical skills and talents in Kansas City and during visits to Florida, Chicago, the Caribbean and London. Meeting individuals such as Nancy Wilson, Clark Terry, Alaadeen, Tom Ransom, Chris Burnett, Teri Wilder and Clarence Smith have encouraged her to continue listening and growing to become an even more versatile musician.